It’s so difficult to catch up with a muse. Getting a muse to talk is even more rare. However, it can happen, if you’re sufficiently persistent. This muse reluctantly agreed to a brief interview and quick photo-op. Think about it for moment and you’ll see that’s not the right question. Do you ask a tree why it’s a tree? It’s like chewing bones, taking naps, howling and prowling. It’s just what I do. Silly human. OK, let me try this: Fiction or nonfiction? Easy. Fiction every time. I see no purpose in regurgitating too much reality. Like any other muse, I just want to have fun. I like spy stories. Also, stories about submarines. I like watching everything, pretending that I’m a spy. I also like to take a swim from time to time. Submarines smell pretty special. Have you ever tried one? When you write fiction, how do you come up with your characters? What’s your inspiration? Well, I like people. And, I love to sniff them. Sniffing gives me great images. I put those images together and, wholly-bang, there’s a new character. I also like animals. Good smells, good visuals. What about story lines? Where do yours come from? Everything I see around me and, believe me, I get around. Almost everything I do is a story, so it’s pretty easy to come up with something interesting. Watching people also helps me. They do some fascinating, entertaining things. They always seem to be doing something they believe is important but I’m not so sure. I think many of them are spies. Some of them live in submarines. If you could pick one and only character as your favorite, who would it be? The cat that lives with me. She likes to snuggle up when we sleep and she helps keep me warm. She doesn’t eat my food and I’m pretty much the boss, mostly. So, I’d go with her. Sometimes, I worry, though. When she’s mousing, I wonder if she’s a serial killer, or a spy. I don’t think she’s ever been on a submarine. Novels or short stories? Which do you prefer? Keep it short. My attention span has never been that great. Do you have a writer’s sanctuary? What’s it like? Sure. Doesn’t every writer? Mine is about six-feet by four-feet and outfitted with some cushy old rugs that smell really great. I spend lots of time in that sanctuary. When you’re not writing, what do you do with yourself? I nap a lot. Sometimes, I prowl around. Searching for food is a good way to kill a few minutes. Most of all, I like to spy on the humans that come and go throughout my life. They’re very entertaining. A muse is where you find it. This entry was posted in Humor, Writing and tagged Art, Muse, Online Writing, publishing, Short story, writers, Writing by Michael D. Kelleher. Bookmark the permalink. I think sniffing is a muse kind of thing. Several of mine have that habit. Thanks for stopping by. Love this post. Love dogs. Delightful. Thanks. 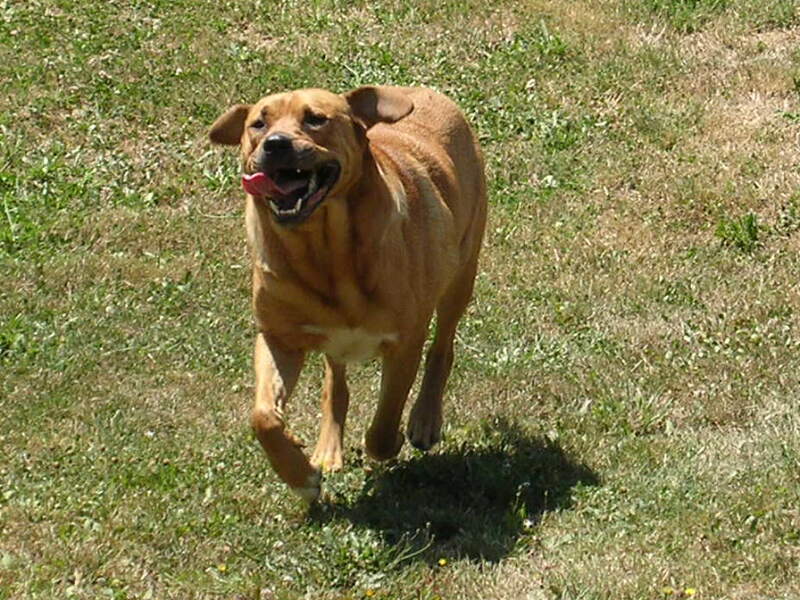 Actually, that photo is of my favorite hound, romping around our fields. He was a genuine muse, and just a bit strange.